It is a deep honor to welcome you on this journey into the sacred mountains of Peru. 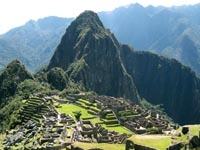 This is truly a unique opportunity to traverse and explore the high Andes as well as Inkan power centers like Machu Picchu with the comfort and style we appreciate at home. We will explore the depths of beauty within ourselves and the picturesque mountains of Peru through yoga, trekking, massage, ceremony and much more. You will have the opportunity to challenge your edges both physically and spiritually. This is a week for you, a week of balance, growth, and expansion. We have been blessed to encounter and work with shamans more recently open to sharing their wisdom with light workers of the west. The Peruvians we will be sharing the week with have become some of our mentors, family, and friends. They have kindly offered to share their wisdom of the Incas, Machu Picchu and other sacred sites with our community. With much gratitude, we thank you for joining us on this journey to the heart of the Incan civilization.